Only 3 ingredients needed for these super easy and tasty Barbecue Bacon Meatballs! Wrapped in bacon, and coated with BBQ Sauce, both kids and adults will gobble these meatballs up. 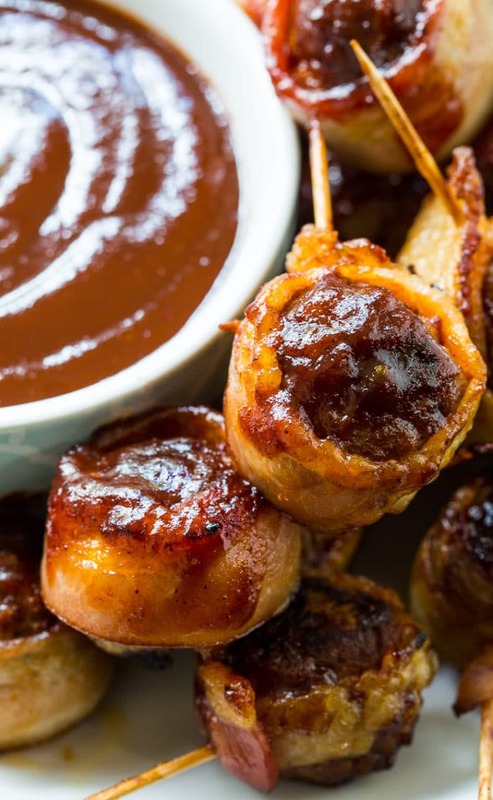 Finger foods are always popular on game day, especially if they include bacon. I start with frozen meatballs that have been partially defrosted. You can either place them in the fridge for awhile or defrost them in the microwave for a few minutes. You just need to be able to stick a toothpick through them to secure the bacon. 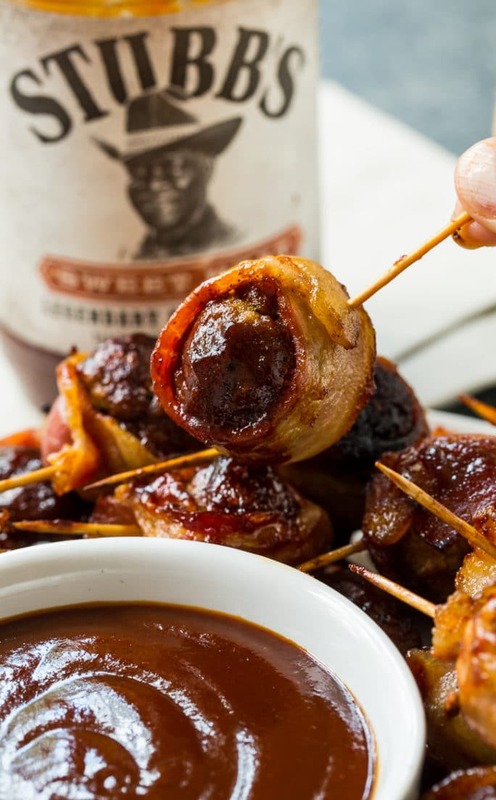 Meatballs wrapped in bacon are already delicious but when you coat the meatballs in Stubb’s Bar-B-Q Sauce and then brush the bacon with more sauce, they get an awesome smokey, spicy, and sweet flavor. Stubb’s makes a lot of different Barbecue Sauces that are widely available. I used their Sweet Heat BBQ Sauce for this recipe but Original, Spicy, or Sticky Sweet would also be delicious. Stubb’s Bar-B-Q Sauces are made with quality ingredients and contain no high fructose corn syrup. I think they are by far the best tasting bottled bbq sauce. Once coated in sauce and wrapped in bacon, the meatballs are baked in the oven until the bacon is crispy. 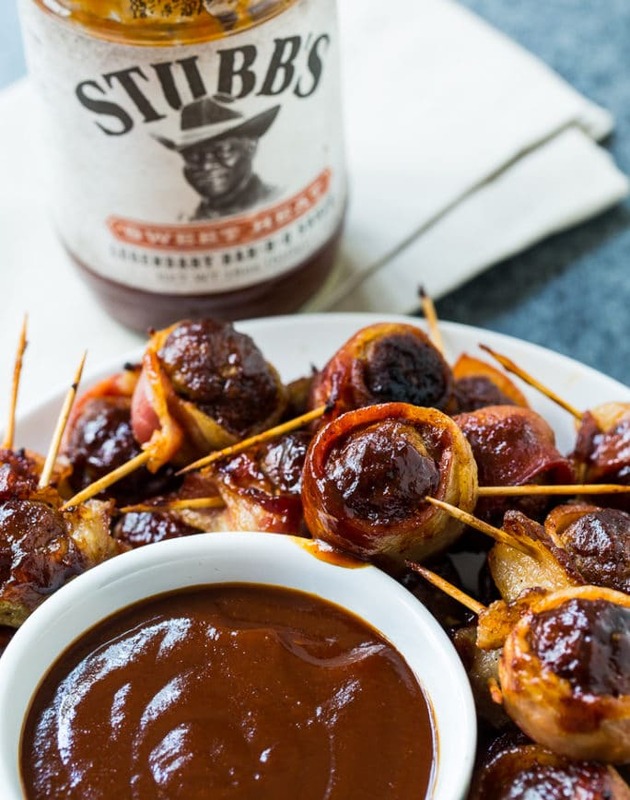 Serve Barbecue Bacon Meatballs with a little extra warm Stubb’s Bar-B-Q Sauce for a super fun party food. 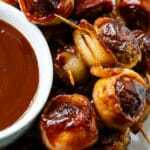 Super easy and delicious Barbecue Bacon Meatballs make a fantastic party appetizer. Place about 1/2 cup Stubb's BBQ Sauce in a medium bowl. Toss meatballs in BBQ sauce. 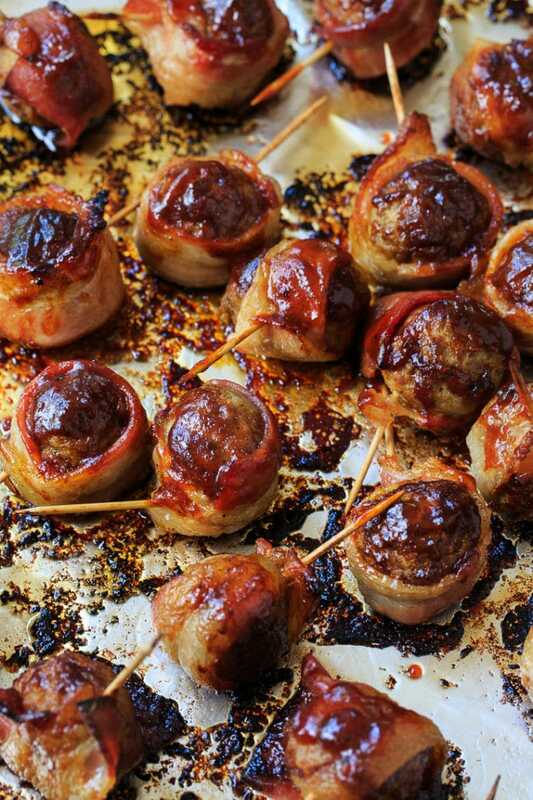 Wrap a piece of bacon around each meatball and secure with a toothpick. Line a baking sheet with aluminum foil. Lightly spray with cooking spray. Remove meatballs form oven, baste with bbq sauce and place back in oven for about 15 minutes, or until bacon is crispy. 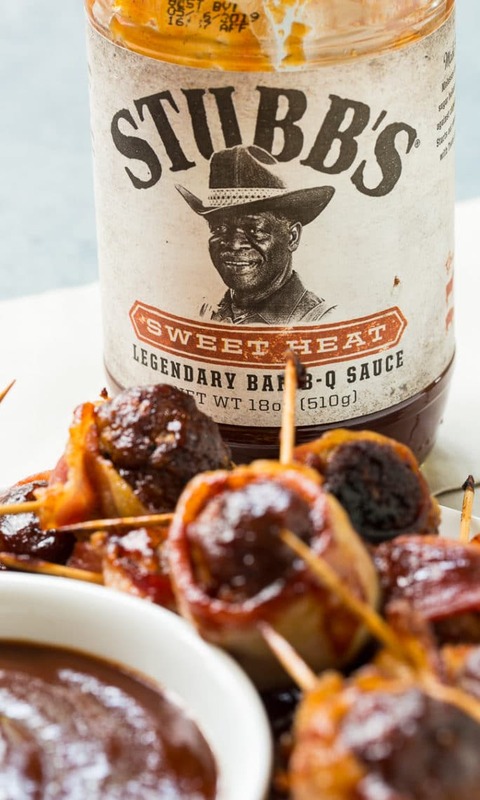 Serve with additional Stubb's Bar-B-Q Sauce for dipping. This entry was posted in Appetizers and tagged bacon, meatballs. Bookmark the permalink. Wow, what a great recipe! I want to make this special for my husband, he likes meatballs so much. Will definitely try this. Thanks for the awesome share. Whoa! Awesome game day offering and we love Stubbs BBQ sauce! Delicious! Take care. This looks AMAZING!! I’m drooling just thinking about making them!! Thanks for the quick and easy recipe!